SRG CULINARY BLOG: Cultural Curiosity: Does Boulder have real Mexican food? Finally, yes. Cultural Curiosity: Does Boulder have real Mexican food? Finally, yes. Given its prime Southwest location, Boulder is surprisingly devoid of authentic Mexican restaurants. Sure, there's the Rio, Zolo, and Centro. But each of those has a twinge of Americana that makes it too college-y or too upscale-international for true, south-of-the-border cuisine. This is a real shame, because it means that neither we, nor our visiting clients, get to experience the real Mexican flavors that are penetrating contemporary U.S. cocktails and cuisine. Bars nationwide have taken on tequila and mezcal as their star spirits. Mayahuel in New York City serves only those liquors. Similarly, modern Mexican chef Richard Sandoval (of Denver's Tamayo and Zengo) just opened the East Village bar La Biblioteca de Tequila, which staffs a tequila librarian. Mexican street food has also risen in popularity. Lines outside Santa Barbara's Super Rica Taqueria frequently extend down the block, and the chef of Minneapolis' Barrio Tequila Bar--a hot-spot for tacos, empanadas, and sopes--received a James Beard's Best Chef Midwest award in 2009. As our nation has expanded its relationship with Mexican food, Boulder--with one expectation--has sat back and watched. The exception, though, is a notable one. 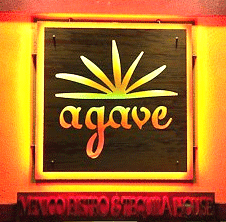 Our town's newly opened Agave Mexican Bistro and Tequila House brings to life many of the traditional dishes and flavors that are inspiring chefs across the country. The spot, on 28th street, serves up red chile-stewed cactus, tequila-glazed catfish, shrimp tacos, and much more. Cathryn gives the menu, down to the coin-style margaritas, her two thumbs up--and we recommend that if you, or your clients, need a dose of true Mexican food, not to mention a fun lesson in food trends, this is the place to go. If you ever find yourself in Denver check out this joint in the Highlands. One of my favorites.